Clare during a marine conservation action project that looked at the effects of Rock Doves on native Pigeon Guillemots along West Cliff in Santa Cruz. Clare and her partner, Tom Roher, brought home many first, second, and third places at the recent UC Santa Barbara "Beach Ball" ballroom competition. This video is their Latin Silver Rumba Final Round. Most people wouldn’t be able to find any connection between an elephant seal and the cha-cha. But 20-year-old Xochitl Clare isn’t most people. For her, it’s easy to see a link between a 4,000-pound pinniped and a boisterous form of Cuban dance. 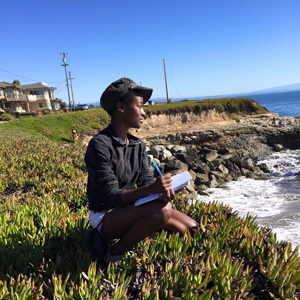 Not only does the marine biology and theater major study one and practice the other, but she also sees a very real relationship between art and science. “Science is an experiment with yourself, and art is the same way,” says the fourth-year Kresge College student. “You have an idea, an interpretation of the world, and you try to work it out. With science your medium is labs and test tubes, with art it’s paintbrushes and movement. Raised in Glendale by an artist mother, Clare’s childhood home was filled with books and music. But it was a picture book about life under the ocean that set her on a career path at the tender age of 7. “It really transformed the way I thought about things,” she says. Drawn to UC Santa Cruz by its marine biology program and its spirit of adventure, Clare says, she eventually found herself working in Professor of Ecology and Evolutionary Biology Dan Costa’s lab. There, she ran something called a bomb calorimetry machine, which is used to determine how much energy is in the deep-sea fish elephant seals eat and also help understand what drives the big seals to seek that prey. But if running a lab machine is work that requires a certain stillness, what Clare does for her theater major does not. She’s not only won awards competing with UC Santa Cruz’s ballroom dance club (her specialties are the rumba, cha-cha, samba, and jive), but she’s also appeared in a number of campus stage productions, including Tandy Beal’s upcoming Nutcracker-inspired show, Nutz Re-Mixed! She’s also directed two plays for the campus’s Rainbow Theater, including Pearl Cleage’s A Song for Coretta. The play is a celebration of Coretta Scott King, widow of civil rights leader Martin Luther King Jr., as seen through the eyes of five female mourners at her funeral, including an Iraq war veteran, a survivor of Hurricane Katrina, and a college student. For Clare, dancing, directing, and lab work are all a part of moving toward a career in research. 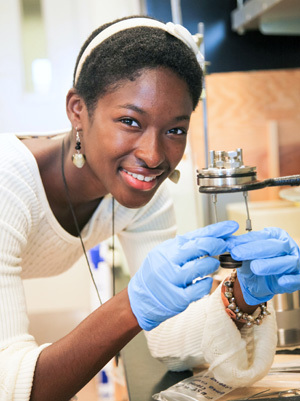 “You have to have an artistic and creative mind to do good science,” she says.